Scones are one of my favorite things to make. They are pretty quick and easy and with this recipe, I've found them pretty fool proof! I've made this recipe with slight tweaks many times before. I've changed the sugar amounts, the mix ins and the kinds of milk used and it always turned out great. The recipe is very similar to making biscuits, so if you know your way around a biscuit, this will be a breeze. And if you don't, I swear its simple enough for anyone! So it starts with mixing all the dry ingredients in a bowl. You can either sift or whisk. I generally whisk because I honestly hate sifting. I know, people are not going to be happy with me about that! So into the dry ingredients, goes a stick of butter that has been cubed. Cubing makes it easier to cut in the butter. Then with a pastry blender, two forks or even your hands, cut the butter into the flour until it resembles mall pebbles or pea sized pieces. Mix in the cocoa nibs and chocolate chips. Create a well in the center of the mixture. In a separate bowl whisk together the eggs and the heavy cream. Pour the liquid (reserve any liquid left on the bottom of the bowl for brushing onto the scones later) into the well and with a rubber spatula gently fold everything together. The dough will be messy and a but hairy, but its ok! Turn this dough out onto a floured board and knead about 25 times till it becomes cohesive and smooth. Divide the dough in half, and shape into rounds about 6" in diameter and 1" thick. Cut each round into 8 triangles or pie slices. Place each triangle on a parchment lined baking sheet. Brush what's left of the egg/ cream mixture. Sprinkle of Demura or turbinado sugar and bake at 425F for 15 minutes. Scones should be golden brown around the edges. You can wait till they cool or I love to eat these warm with a glass of milk. 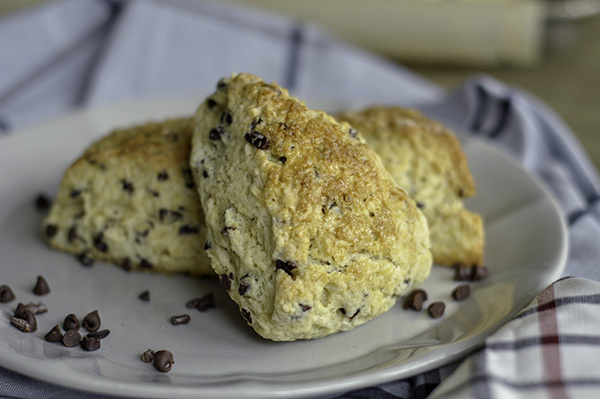 These scones are moist on the inside with a slight crisp on the outside. and have a great chocolate flavor without all the sugar. For extra indulgence, try topping these with lightly sweetened whipped cream or even better, clotted cream. You can find it in most grocery stores. If not a pat of butter and a cup of tea also does the trick just fine! Try this recipe and let me know how it turns out! An follow me on instagram for more posts on my bakes and eatings around town! Knead dough 25-30 times on well-floured surface with well-floured hands until the surface of the dough is smooth and doesn't have any cracks. Divide the dough in half. Create 2 round circles with the dough about an inch thick. You can either use a rolling pin or I just used me hands to shape it. 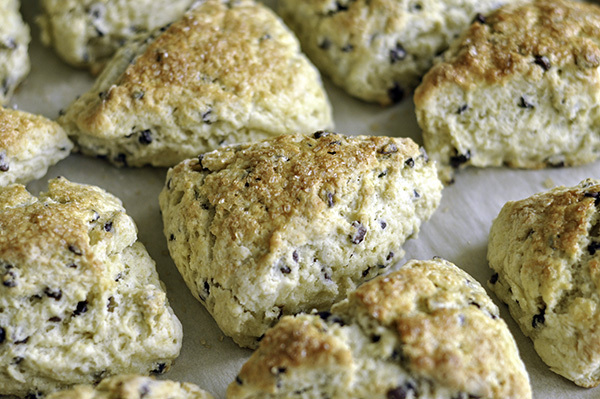 Brush onto the tops of the scones with the reserved cream and sprinkle on the demura sugar. Turn down the oven to 425 F. Bake scones for 15 minutes or until golden brown.